Volunteers donate their time, knowledge, experience and enthusiasm when they lead Section day and weekend trips, organize Section training, serve on the Section executive or on Section committees, organize ACC summer camps, host slideshows, host our book club. Volunteers receive no payment – outside of the words of appreciation we pass on at the end of an event. If it weren’t for our volunteers, we wouldn’t have a great program of activities to offer our members. We are inviting Ottawa Section members to come out and show their appreciation to our volunteers! Say “thanks!”, “glad I joined the club”, “had a great time on our last trip”, “great group of people”. And it’ll be a great opportunity to meet and socialize with fellow ACC members! Are you an Ottawa Section volunteer? We are inviting current Ottawa Section volunteers to be guests of the Ottawa Section. What: Your ticket includes dinner and a craft beer or a glass of wine or a soft drink. All attendees will pay for additional drinks and/or other types of drinks. REGISTRATION and PAYMENT Required in Advance – REGISTER NOW! You can pay using your credit card or your PayPal account. All attendees must register in advance – so we will know the numbers (for food). PLEASE NOTE: You DO NOT need to have a PayPal account to pay. You can pay using your credit card. This clinic provides an introduction to off-track Nordic ski touring in hilly, wooded terrain typical of Gatineau Park, the Laurentians and New England. We will also briefly discuss alpine backcountry skiing in mountainous terrain using Telemark or alpine-touring (AT) equipment but, otherwise, that ski discipline is not part of this clinic. There are two evening classroom sessions before Christmas (timed so participants can provide Santa with helpful hints) and two field trips in January. A fee of $25 will cover costs. Pre-requisites: (1) physically fit, (2) a minimum of one year classic “cross-country” trail skiing, (3) will own or rent appropriate Nordic BC ski gear in time for the field trips and (4) demonstrated backcountry map and compass navigation skills. A separate navigation clinic will be offered by Darrel Newman for those attendees of this ski clinic needing to refresh their map and compass navigation skills. Limit 12 ACC members. Tues Nov 21st @ 6:30pm – Nordic backcountry ski touring equipment – all you need to know to buy or rent suitable gear. Tues Nov 28th @ 6:30pm – soft skills including clothing, contents of a skier’s pack and backcountry skiing safety. Sat Jan 20th – a day practicing techniques for ascending and descending moderately steep hills, plus a practice emergency scenario. Hobnails And Hemp Rope pays homage to Conrad Kain, Austrian-Canadian explorer and the ACC’s first professional mountain guide, whose team successfully reached the Bugaboo Spire’s summit in 1916. To celebrate the Kain expedition, four modern-day climbers used gear, food and climbing gear similar to what would have been used 100 years before. Scaling this coveted mountain is no easy climb. The granite spire rises up to an elevation of 3,204 meters and rests between the Vowell and Crescent Glaciers. Members and Non-Members are invited to attend the Ottawa premiere of the screening of the adventure to commemorate the 1916 ascent of the Bugaboo Spire. 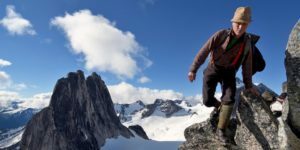 The Royal Canadian Geographical Society (RCGS) in association with the ByTowne Cinema are pleased to present the Ottawa premiere of Hobnails and Hemp Rope, a 25-minute documentary about the Bugaboo Spire Centennial Climb Project. Greg Gransden, director of Hobnails and Hemp Rope, and Bryan Thompson, expedition leader, will be on hand to answer audience questions after the screening. A stunning collection of Ivan Petrov’s expedition photography will be on display, along with vintage mountaineering gear and research materials used on the project.